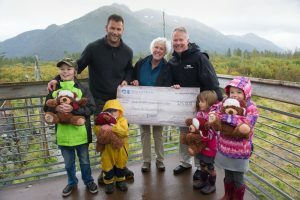 Princess Cruises presented its first donation from the Princess Animal Welfare Sponsor (PAWS) to the Alaska Wildlife Conservation Center (AWCC) in the amount of $25,000. PAWS was established by Princess Cruises to donate a portion of proceeds from the sales of Stanley the Bear, the cruise line’s recently introduced plush bear, to local causes and charities that support nature, animals and wildlife. “Our support of the Alaska Wildlife Conservation Center furthers our commitment to nature and wildlife in the places we visit, as well as offers a much-desired authentic Alaska experience to our guests,” said Ralph Samuels, vice president of public affairs, Princess Cruises. The AWCC plans to use the donation to fund an enhanced bear viewing and sitting areas on the property and a new family interactive space. In addition, the AWCC will be providing Princess Cruises bear related items, such as bear paw prints to be used in the cruise line’s Camp Discovery youth centers. “We’re honored to be the first recipient of $25,000 from the Princess Animal Welfare Sponsor and applaud the cruise line for supporting our sanctuary, dedicated to preserving Alaska’s wildlife through conservation, research, education and quality animal care,” said Karen Cowart, AWCC board member. Named in a Facebook contest that generated nearly 9,000 entries, Stanley was chosen in honor of the founder of Princess Cruises, Stanley B. McDonald. Debuting in May 2017 for the Alaska cruise season, Stanley the Bear interacts with guests through various entertainment and enrichment opportunities and is available for purchase on board in The Shops of Princess and in the Princess Wilderness Lodges in Alaska for $24.95. Princess Cruises donates a portion of the proceeds from the sale of this bear to support PAWS: Princess Animal Welfare Sponsor, an allocated fund within Princess Cruises Community Foundation. For nearly 50 years, Princess Cruises has been recognized as the destination leader in Alaska and has been named “Best Cruise Line in Alaska” 10 consecutive years by Travel Weekly magazine. On board, Alaska guests experience the award-winning program, North to Alaska, which includes unique Alaska onboard enrichment , entertainment and food and beverage offerings, as well as Discovery Channel and Animal Planet recommended and exclusive shore excursions, as part of the cruise line’s Discovery at Sea partnership. More information can be found at www.princess.com/alaska.